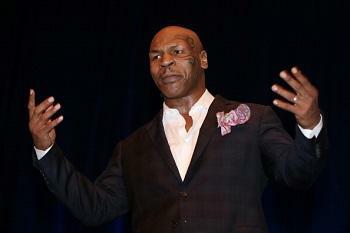 Mike Tyson is used to squaring off against opponents in the ring. But the boxing legend is hoping to best his latest foe through the legal system. Tyson and his wife Lakiha are suing events giant Live Nation and its subsidiary, SFX Financial Advisory Management Enterprises, claiming that the person that Live Nation appointed to look after their finances embezzled from them, causing them damages "in excess of $5,000,000." Brian Ourand (also named as a defendant in the suit) was appointed to handle the Tysons' finances on behalf of SFX -- but instead, the suit claims, he embezzled more than $300,000 from the couple. The Tysons claim that Live Nation didn't inform them of the alleged theft until they asked why Ourand had been taken off of their account, and were later sent a legal document directly, rather than through their attorney, that would have waived the couple's right to file a lawsuit if signed. A spokeswoman for Live Nation has not yet responded to The Wrap's request for comment. The alleged $300,000 theft caused a ripple effect, the suit claims. The couple were forced to mortgage their home, and had to borrow money "to fund the IRS," the lawsuit -- filed in Los Angeles Superior Court on Wednesday -- says. According to the complaint, they were also deprived of "lucrative business opportunities" while the bankruptcy proceedings dragged on, and were "forced to enter into an onerous bankruptcy settlement." "Defendant Ourand and Defendant SFX/Live Nation deceived the Tysons in the worst possible way at the worst possible time when the Tysons needed them to conclude Mr. Tyson's bankruptcy proceedings," the suit reads. The suit alleges negligent hiring, retention and supervision; conversion; breach of fiduciary duty; fraud; and unjust enrichment. Along with an accounting of " the funds stolen by Defendant Ourand," the suit is seeking economic and compensatory damages, along with punitive damages, court costs and attorneys' fees.